By Jesse Muñoz For The Signal Just one game into the 2018 season College of the Canyons freshman kicker Tanner Brown is already having a major impact for the Cougars. On Tuesday, Brown was named the Southern California Football Association (SCFA) National Division Special Teams/All-Purpose Player of the Week after kicking four field goals to help lift the Cougars to a 19-6 road win over Saddleback College in week one. The next day the Cougar kicker reported to the weight room well before the mandated 2 p.m. start time, ready to get back to work. “I’m just doing everything I can at practice to get better every day, doing what I can in the weight room to get stronger,” said Brown, who came to COC by way of Saugus High School where he played both football and soccer. “Trying to kick further and harder and higher, perfect it all.” In fact, Brown was perfect against the Gauchos on Saturday. The freshman converted on all four field goal attempts, connecting from 21, 41, 40 and 25 yards out, with the final three kicks all coming in the second half. He also executed COC’s lone PAT attempt. “Anytime you can make field goals when your offense is stuttering, that’s a huge weapon for us,” said COC head coach Ted Iacenda, who is in his sixth season at the helm. “Normally we’d be punting from down there and coming away with no points. For us to be able to come out with 12 points in field goals, that’s huge. That was the turning point in the game.” Brown also handled all punting and kickoff duties for the Cougars. He totaled five punts for 154 yards with a long of 43 yards and pinned Saddleback behind its own 20-yard line twice. On kickoffs, Brown recorded six kicks for 356 yards with one touchback, an average of 59.3 yards per. “He’s a tremendous talent,” said Iacenda. “I don’t think you ever can predict that type of success, but we wouldn’t have kicked him if we weren’t confident that he had the leg to make them.” Brown admits he did experience some early-season nerves the first time he trotted out there to kick. But he also seemed to have the perfect remedy. “Yeah, I was nervous, but I just didn’t let it get the best of me,” Brown said. “I tell myself, it’s just like an extra point. It’s the same thing, just keep it smooth. 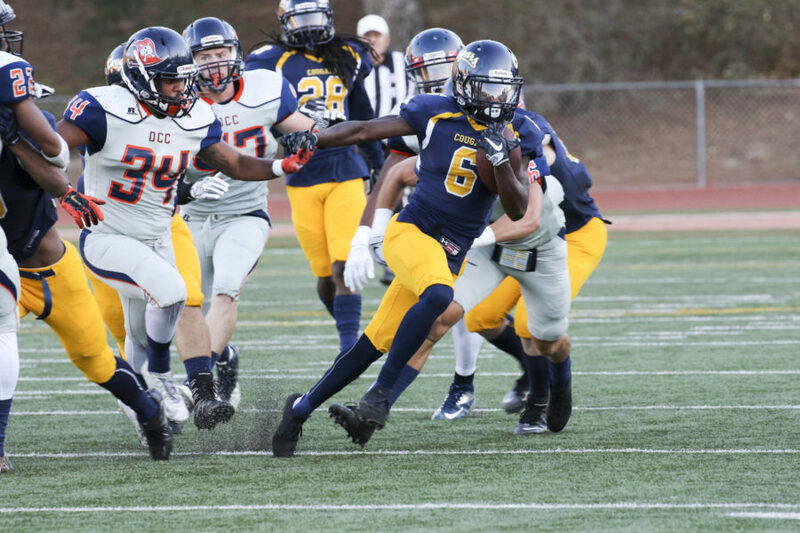 And as long as I keep it smooth and don’t force or rush anything, then I know I’m good and I know it’s going in.” Canyons (1-0) will next face Grossmont College (0-1) at 3 p.m. Saturday, Sept. 8. That contest will be played at Grossmont High School in El Cajon. The Cougars enter the game ranked No. 6 in the state according to this week’s JC Athletic Bureau Head Coaches Poll. COC is also No. 7 in the California Community College Sports Information Association (CCCSIA) Preseason Poll released on Wednesday. Grossmont remains unranked after suffering a 38-21 road loss at the hands of Long Beach City College last Saturday. The Griffins did manage to score a pair of fourth quarter touchdowns, but were otherwise kept in check, mustering just 197 yards of total offense while turning the ball over five times. Canyons is coming off of a strong defensive performance of its own. The Cougars limited Saddleback to just 21 yards on the ground and 130 yards through the air last week, and also forced three turnovers in the game, with seven tackles for loss and two sacks. COC and Grossmont last met in week five of the 2017 season, with the Cougars able to pull out a 29-28 road victory.